The house was deathly quiet when Cream woke up. Her eyes lit up as she remembered what day it was. "Today's the day!" she screamed at the top of her lungs. "Today's the day that Lina's getting us a new sibling!" Several groans reached Cream's sensitive Aisha ears as her shouts woke everyone up. "Cream, we know!" her sister, Ray, shouted back. "It's six in the morning; Lina won't be here for a few more hours. Go back to sleep!" Sounds of creaking beds filled the house as the pets shifted and turned, trying to find a more comfortable spot and go back to sleep. Ten Aishas lived in this house, all owned by the human girl Lina. And today, a new Aisha was coming to live with them. They had no idea who it would be, but nonetheless, they were all excited. The Aishas all got along pretty well. Cream made everyone laugh with her jokes and her hyper, energetic behavior. Kimiko was the natural leader, being Lina's first pet and all. Ray was more of a tomboy, spending lots of time working on her Habitarium and studying petpetpets. Kata was the most responsible, making sure everyone cleaned up after themselves and making the house a home. Sweets was perhaps the kindest one, helping everyone she knew, and baking yummy treats that everyone loved. Vineti was the newest member of the family, polite and lady-like. She almost never talked, but when she did, she was surprisingly insightful. Dragon was the artist, constantly drawing sketches of petpets playing in the park or Pteris flying overhead. Ed was the athletic one, always trying to engage his brothers and sisters in a game of Yooyu ball. Yellow was deeply attached to his family, always tagging after Ed or Dragon or Cream. Some of them were adopted, some were created, but it didn't matter which was which. They all loved each other. But today, a new family member would join their midst. As the sun slowly trickled over the horizon, one by one they got up. They assembled in the living room, munching on their breakfast and keeping an eye out the window for Lina. The plan had been for Lina to go straight to the pound and come home around noon with their new brother or sister. Lina had met another owner who was adopting out her Neopets. Lina had asked if she had any Aishas up for adoption, and then said she would gladly adopt. She hadn't told Lina anything about the Aisha, leaving its gender and personality a mystery. But no one was worried; they all got along so well, what could one Neopet do to change that? Noon came and went. One o'clock, two o'clock, three o'clock. The hours ticked by, and everyone started to get worried. "Maybe we should contact the Chia Police," Kata said. Kimiko looked out the window one more time, before exclaiming, "No, wait! I see her now!" They all crowded around the window, straining for a glimpse of their new family member and wondering why it took Lina so long to get back. "Is it... Is it a Skeith?" Ed whispered, disbelieving. Two stout Skeith-like legs could be seen struggling under a huge pile of suitcases. Lina was walking next to the mysterious Neopet, carrying quite a few bundles herself. Her brow crinkled and her eyes had a dream-like quality. She seemed like she was in shock. They approached the door, and Kimiko rushed to answer it. Lina walked in and carefully set the suitcases on the ground. The Skeith blundered after her and with a huge crash, deposited the towering boxes and bags all over the floor. "Careful with those!" a voice screeched. "Some of those clothes are vintage!" In the door way, a mutant Aisha stood glaring at them all, her mouth-like ears growling in protest. She carried no bags except for a wicker cage, in which a menacing hissing could be heard. She sighed exasperatedly before turning to Lina. "Where is my room?" she demanded. "Philesia, these are your new siblings," Lina said, gesturing to the gaggle of Aishas huddled in the hallway. They all stared at the mutant Aisha. "Everyone, meet Philesia. She's your new sister." She was a strange combination of exotic and horrifying. Her pristine fur was a greenish blue, like the color of a deep tropical sea, and obviously well groomed. Her one abnormally large eye did not appear lopsided or dull as other mutant Aishas' eyes appeared to be, but was instead bright and surprisingly full of disdain. Her long ears perched on top of her head like snakes, with their teeth gleaming like pearls and tiny, delicate tongues sliding in and out of their mouths. Her movements were graceful and appeared both calculated and whimsical, as if she planned them out carefully yet also acted on her instincts. She was, without a doubt, beautiful. She studied the ten Aishas in front of her, painted rare colors like Desert and Chocolate yet not even comparable to her beauty. "Hello," she said carelessly. Then she turned back to Lina. "My room?" "Up here," Lina answered, before turning to the Skeith and giving him a sack of Neopoints. "Thank you for helping us. My pets should be able to handle it from here." She picked up a couple of bags, motioning for everyone to do the same, and Philesia followed her up the stairs. "A mutant?" Yellow whispered. "Of all the colors to get, she got a mutant?" "Not all mutants are monsters," Vineti replied, equally quiet. She chose a small suitcase and started up the stairs. "UGH! WHAT IS THIS? My old room was SO much bigger! You told me you had a BIG neohome! This is hardly even a shack! And an Orange Kreludan Bed? That's not even worth 1,000 neopoints!" "The furniture is only temporary. I didn't know what type of décor you would like, so I was going to take you shopping tomorrow," Lina quickly protested. "Humph. That will do, I guess. Still, if you had any taste at all, you would have gotten better furniture, even if it is only 'temporary.'" "Not all mutants are monsters, but this one certainly is," Ray grumbled under her breath. "Why does she even need all these bags? Mutants can't wear clothes!" They carried Philesia's various suitcases up the stairs and crowded around the doorway for a better look at their new, beautiful, self-centered sister. She was sitting on her cheap Orange Kreludan Bed lightly, her muscles taught, as if ready to leap from the mattress if its commonness proved to be contagious. The wicker cage was open now, and in her lap was a Grey Bluna. Like its owner, the Bluna was beautiful. Despite its depressing color, it did not appear sad or lost, but instead proud and vain. Sweets, determined to make the newcomer feel welcome, strode into the bedroom. The Philesia's ears whipped towards her immediately, while Philesia herself turned her head more slowly. She scrutinized Sweets' checkered coat and lack of customization, as if it summed up her whole personality. Sweets ignored the studying gaze and sat next to Philesia. "What's her name?" she asked, gesturing towards the petpet. "Puppup. She's a purebred. Well, she was a purebred. 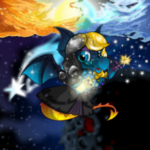 She was zapped by the petpet lab ray and became this gorgeous creature." Philesia scratched Puppup on her head, and the Bluna produced a purring sound. Sweets reached her paw out to pet Puppup, but the Bluna hissed and flung herself away from Sweets. "It must be hard being abandoned and then getting a new family," Sweets persisted. "But don't worry; A lot of our brothers and sisters are adopted." "Excuse me?!" Philesia screeched, her ears rearing back and throwing their mouths open wide. "I chose to be adopted out!" She stomped towards the door, ready to leave, but saw the rest of the Aishas in the hallway. She huffed and gestured for Lina and Sweets to get out, which they promptly did, before she slammed the door, punctuating her displeasure with the loud BANG! Lina sighed and sank against the wall. "I've never met anyone who's so... so... so demanding," she whispered. "She threw a fit at the pound when her old owner and I were filling out the transfer papers. Starting crying and screaming just like a toddler. And when that didn't work, she just got all quiet and sullen." "I bet she'll be a blast at Neoschool," Ed murmured, causing Lina to groan. Dinner was an uncomfortable affair. Lina ordered a delicious dinner from an expensive, well-known Shenkuu restaurant. Philesia came down the stairs when called and studied the food the way she scrutinized everything else. "Well, at least it's not omelette," she concluded. "I half expected to see jelly." No one really knew how to best incorporate someone like Philesia into their conversations, so they mostly ignored her and she them. Except when the conversation turned to school. "Yooyuball season is about to start up again," Ed said, taking a sip of water. "I'm trying to convince Ron to join the team; I can score a goal, no problem, and the team overall has great offense, but we really need to concentrate on defense. I've seen the way Ron plays Yooyuball in gym, and if we could get him as a goalie, we'd win the school tournament." After a serious moment of thought, he added "Maybe we could qualify for the Altador Cup." "Oh, you're an athlete?" Philesia said, turning her gaze toward Ed. "Yes. I mostly play Yooyuball, although I enjoy Wingoball and other sports too." "Do you play any sports, Philesia?" Lina asked, excited to learn more about her new pet. "Coltzan, no!" Philesia said, flicking her fork as if it was obvious. "Too much sweat, too great a chance of injury. But I have to keep up with it all. You never know when you'll need to talk about sports." She turned back to Ed. "You be sure to let me know when the games are; I'll need to be there." "Is there anything about our school you want to know, Philesia?" Kimiko offered hopefully. "What's popular? Names? Species? Customization?" "Um..." Kimiko looked to her siblings for help. "Probably color is most important, then name," Kata interjected. "Although almost everyone in our school goes by a nickname." "Nicknames." Philesia stared at Kata with her one, large eye. "Yes, nicknames. Everyone in our family has them, except for Sulza and Vineti." "So I assume you all have super long, cheesy, unoriginal names that end in a jumble of numbers?" "Hang on a sec there," Line objected, "Philesia is only a nickname too." 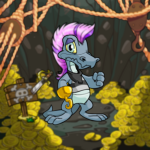 All the Neopets stared at the mutant, surprised by this common flaw. "Philesia is not a nickname. It is the English version of my name, fyjsdo." "The English version?" Cream said skeptically. "What, is fyjsdo a Tyrannian name or something?" "No, it's Mutant," Philesia snorted. "I'm fluent in English, obviously, but every Mutant has a basic understanding of their own language." "Mutants have their own language?" Ray said, equally skeptical. Philesia sighed dramatically, then let out a sound. A gurgling, rumbling, growling sound that would make you run for the protection of your mommy. It sounded like pain, like loneliness, like anger, manifested into an audible form. Cream pushed her plate away. "I'm not hungry anymore." "Well, you're the ones who didn't believe me. That was a sentence in Mutant. I'm rather lucky, to be honest. My jaw and tongue are still shaped relatively normal. Many mutants' mouths get so twisted that they can only speak Mutant." Philesia stood up suddenly. "I'm going to bed. Tomorrow, we need to redecorate my room." The next evening, Philesia stormed up the stairs. She shut her door, sighed, and leaned against it. Her ears whimpered sympathetically, and she absentmindedly reached up to scratch one. That day could have gone a lot better, she thought. Lina had given her 30,000 neopoints to buy new furniture! Only 30,000! Considering the fact that she needed a bed, dresser, vanity table, night stand, a petpet bed for Puppup, and rocking chair, not to mention decorations such as painting, posters, rugs, and curtains, 30,000 was barely enough to buy even the most basic necessities, which were still unattractively common. She was forced to make a few compromises; she got rid of all the orange Kreludan/Grundo furniture, accept for the bed. And no decorations besides a fun, star-shaped blue rug and a few throw pillows. It was the best she could do, but it was still horrid. Philesia protested greatly and demanded more, but Lina was firm; in fact, she even threatened to take away some of the money! Her ears growled at the thought. But Lina had promised more furniture for Philesia's birthday, which was in a few months. If she could wait that long. Philesia sighed and thought longingly of her old room. Her huge, purple bed with the light curtains, the abstract paintings that accented the room and were fun to look at... All of it was beautiful, expensive, and most important, rare! As Philesia knew, beauty was not so important as rarity. If every ordinary pebble was a diamond, people would not covet them so much. She felt tears threatening to spill, and blinked them back. She missed her old family. Puppup slithered out of her cage and blinked questioningly at her owner. "You're right, Puppup darling," Philesia said, taking a deep breath and standing up. She walked over to the mirror and started fixing her makeup. After dabbing a little eyeliner on, she continued talking. "They gave me up. They did not appreciate me for who I am, and we all knew I would have more opportunities here, with Lina." She observed her makeup, snorted, then started removing it. "Puppup, we can only hope that there are some popular people at school, and that not everyone here is as challenged as these Aishas." Thankfully, Lina gave her pets the option of bringing or buying. Philesia didn't want to deal with the embarrassment of bringing a bag lunch. The morning of Philesia's first day, the school was buzzing with rumors about the new pet. First impressions are important. Philesia had chosen a dramatic purple lipstick, that accented her pink-and-blue coloring. She was wearing a simple light-blue dress that she had made herself, in order to accommodate for her mutant features. She was stunning. But still, she was a Mutant. Everyone at that school was used to Mutants at best being like every other normal, unpopular pet and at worst drooling masses of pockmarked flesh. Philesia proved them wrong. She flirted and sighed, pouted and smiled, glared and laughed, acting every bit the drama queen she was. When lunch time came, her new siblings watched as she made her way towards the popular table. "This will be good," Cream whispered to Ray. Without even asking, Philesia plopped her tray down between a female Royal Cybunny and a male Woodland Tonu. The pets at that table stared at the bold newcomer, before a Maractite Lutari said, "I'm sorry, but that seat is reserved. Only certain pets can sit here." He smirked and waved goodbye. Philesia laughed in response, a tinkling sound like icicles falling. "Are you implying that I'm not popular enough?" She opened her iced tea and took a sip. The Lutari was used to Neopets responding immediately to his suggestions. He opened his mouth to come up with a witty response. Instead, he said, "You're the new pet, right? Vineti's new sister?" Philesia nodded. "I have, like, a million new brothers and sisters. You would think at least one of them would be cool." The Cybunny next to her replied, "We invited Vineti to sit with us, but she declined." She snorted then, to accent the absurdness of it all. "She preferred to sit with her family. It was quite the controversy, but we really didn't want someone like that at our table." "Vineti hardly talks; I think she's mute," Philesia responded. "She is the only one with a good color and an okay name, though. Sulza does have potential, as long as she's not painted a cheap color. But neither of them are into customization." "My name is Vinny," the Cybunny said, tossing her long ears over her shoulders like hair. "Philesia, although technically it's fyjsdo," she introduced herself. "fyjsdo. That's sounds so exotic!" Stunned, Cream watched as Philesia flawlessly included herself into the popular group, and by the end of the period she was laughing and talking about details for a party with them. "How did she do that?" Cream asked, mystified. By the end of the school day, Philesia had a new flock of friends. She laughed and waved goodbye at them, before walking towards her neohome. Ed, Ray and Yellow all stayed after school, but the rest of the Aishas were walking behind Philesia, who hurried ahead to avoid being next to them. At one intersection, though, she stopped, trying to find her bearings. "This way, Philesia," Kimiko said as the group overtook her. Philesia huffed and followed them. Dinner that night was the best so far. Ed and Ray rushed home as soon as sports practice ended, and Yellow got back an hour later. With only a bit of prodding, Lina got Philesia to talk about her day at school and all her new friends. "And Vinny has a rare limited edition Neocash dress she promised to let me try on! I'm planning on going to her house this Saturday." "That's great, Philesia!" Lina replied. If she made friends so easily, maybe she could learn to get along better with the rest of us, Lina thought. The next day was even better for Philesia. At least, it was until the final bell. Vinny stopped Philesia on her way home. "Hey Philly, do you want to work on that Science project together?" Vinny asked. "Sure, that'd be great," Philesia said, plastering on a smile. In her mind, though, she was thinking about her annoying siblings and her embarrassing Orange Kreludan Bed. She rushed Vinny past Lina, bellowing a quick "I'm home." Unfortunately, Kata and Sweets were already doing homework in the living room, and Dragon was in the dining room, so Philesia led Vinny up to her bed room. Vinny quietly observed the room for a few stunned seconds, before exclaiming, "Philly, I LOVE your color combinations! The orange bed clashes perfectly with your pink and blue fur! It looks like a coral reef!" Philesia smiled, and the two promptly ignored their homework to examine all of Philesia's clothes. Lina waited at the door, peering out the window. It was almost time for dinner. Ray and Ed were back already, but Yellow still wasn't here. She wondered what her Island Aisha was doing; he didn't have sports practice or any after school clubs. Finally, she saw him trudging along the sidewalk. She flung open the door and ran out to meet him. Lina hugged him, before asking "Yellow, where were you? I was getting worried!" "I was just playing with some friends, that's all," he said, shrugging. "Which friends? Were you with Amanda's pets?" "No, just some friends I met at school." Lina looked him in the eye, and Yellow forced a small smile. "I'm okay, Lina. I really am." She nodded, but couldn't help noticing that he was uncharacteristically quiet during dinner. The next evening, Yellow was home at the normal time. He bent his head and tried to rush past Lina, but she held on to his shoulder and forced him to look at her. He had a huge black eye. "Yellow! What happened? Are you okay?" Lina asked, worry penetrating her voice. Philesia walked in then, preparing to ignore her family as usual. But she stopped when she saw Yellow. They heard a threatening growl, and turned to see her ears spitting with fury. Philesia's teeth were clenched. "Yellow," she said quietly. "Who did this?" "No one," he replied, scared. "You tell me who did this!" She roared, causing him to flinch. Philesia stormed out of the house, and Lina called Kimiko to take care of Yellow before rushing after her. She followed her back to the school, and saw her threatening a Woodland Tonu more than twice her size. He sneered at her. "Hey, Phil. Did you see your little nerd brother?" He laughed. "Pretty funny, huh?" "Don't you EVER touch my family again!" Philesia screamed, swinging her fist and punching him in the stomach. "Hey!" he yelled, doubling over. Philesia stormed away as quickly as she had come, but the Tonu yelled "Well, don't expect to sit with us tomorrow!" Lina waited as Philesia got closer to her. They walked in silence for a while, before Lina said, "That was a very brave thing to do for your brother." Then she smiled and added, "But you shouldn't go around punching people." Philesia shrugged. "He was a jerk. He deserved it." Then there was silence again, before she added, "You know, this family isn't so bad." Lina laughed. "We love you too, Philesia." Lunch time the next day, Philesia walked into the cafeteria. She looked over at the popular table, with Vinny and the Woodland Tonu and the Maractite Lutari. The Tonu glared at her, but Philesia waved her hand in a beckoning motion. After a second, Vinny and the other pets at the table, except the Tonu, stood up and followed her to where her family was sitting. "Are you sure you want to sit with your family?" Vinny whispered in her ear as they put their trays down. Philesia shrugged. "Who knows. Maybe they could learn a thing or two about being popular." It's not really made of Draiks, is it? 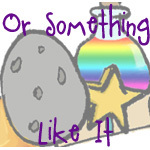 Or Something Like It: I Daily Dare You! I was discussing the possibility of changing pet names with a few people on the Neoboard when I realized how many people were diametrically opposed to each other.